How many seats – and votes – has the BJP lost? New Delhi: The Election Commission of India has now officially announced the final numbers for assembly elections to five states. The Congress has emerged as the single largest party in the Bharatiya Janata Party-ruled states of Rajasthan, Chhattisgarh and Madhya Pradesh. K. Chandrasekhara Rao’s Telangana Rashtra Samithi has easily retained its leadership role in Telangana, and the Mizo National Front has wrested power from the Congress in Mizoram. How different will the state assemblies look now from how they did for the last four years? How many seats – and votes – has the BJP really lost? The Wire breaks it down, state by state. 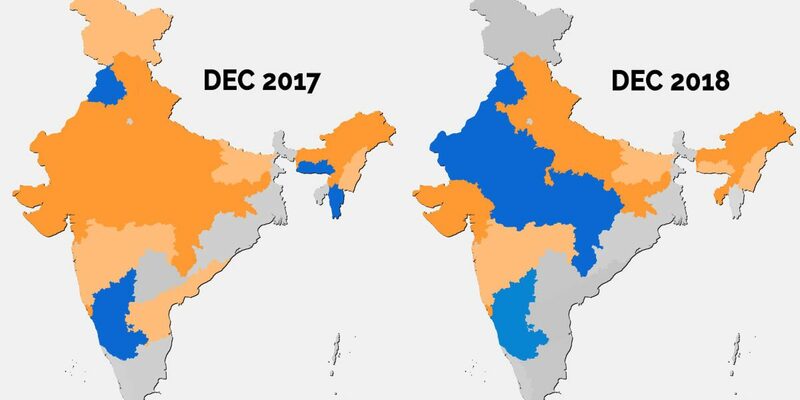 In all three states where the BJP has had an important role to play in previous years, its vote share has shrunk considerably – particularly when compared to the 2014 Lok Sabha elections. Here’s the percentage of voters who decided to move away from the saffron party. In Telangana too, the BJP’s vote share in the 2018 assembly elections (7%) is 1.5% less than what the saffron party got during the 2014 Lok Sabha polls. Let’s begin with the state that went right down to the wire. While the Congress has emerged as the single largest party, with just five seats more than the BJP, it is two seats short of the majority mark. According to the letter state Congress chief Kamal Nath wrote to governor Anandiben Patel on Tuesday night, the party has secured the support of all four independent winners, which will push it over the majority mark. Also read: Seven Big Takeaways from the Assembly Elections ResultsFrom 165 seats in the 2013 assembly elections, the BJP is now left with 109 seats – a loss of 56 seats. The Congress has increased its seat count in the assembly by 56, though it has handed over a few seats it had in the Vindhya region to the saffron party. Results in Rajasthan became clear pretty early in the day on Tuesday, and the anti-incumbency sentiment that had been predicted was clearly visible in the numbers. In keeping with its tradition of not giving any party for more than one consecutive term in power, the BJP under Vasundhara Raje was rooted out and the Congress crossed the majority mark with ease. The grand old party – along with its three alliance partners – has managed to secure 100 seats. Ninety-nine of these seats were won by Congress candidates, and one by the Rashtriya Lok Dal. The alliance is one seat short of the majority mark. The BJP has won only 73 seats this time – down from 163 in 2013, a loss of 89 seats. Chhattisgarh’s BJP chief minister Raman Singh has given his resignation to the state governor after the party’s defeat, and his resignation has been accepted. The BJP only managed to secure 15 seats (down from 49) in the 90-member assembly, while the Congress has won 68 seats – well past the majority mark. The BJP has been ruling in Chhattisgarh for the last 15 years. The Mizo National Front led by Zoramthanga has wrested control from the Congress in Mizoram, winning 26 of the 40 seats. Before the elections, Zoramthanga has correctly predicted in an interview with The Wire that he would not need the BJP’s support to form government in the state. Also read: Here’s What Congress Needs to Do to Continue Its Winning Streak in 2019The saffron party won a seat in the state assembly for the first time ever. Congress chief minister Lal Thanhawla lost in both the seats he was contesting. The grand old party’s seat count in the state fell drastically from 34 to 5. While analysts had said anti-incumbency was likely to play a big role in Telangana, K. Chandrasekhara Rao’s Telangana Rashtra Samithi had no problem retaining its majority in the state. The party increased the number of seats it holds in the assembly, from 63 to 88.